Join us for the 2016 holiday food drive for Three Square! Tis’ the season for giving. 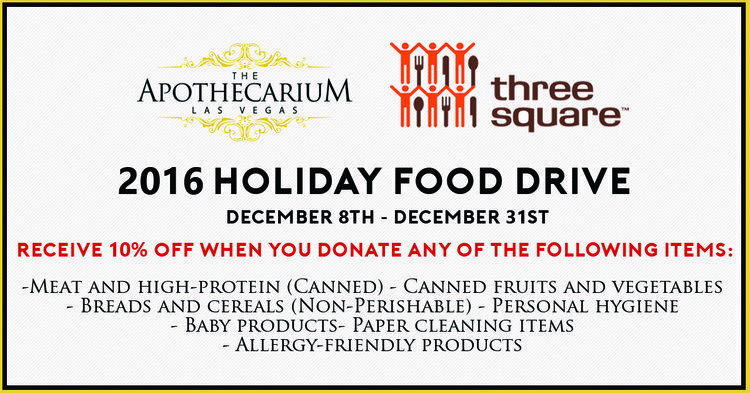 Join us in giving back during the holidays by participating in our food drive for Three Square. Three Square is Southern Nevada’s only food bank providing food assistance to the residents of Lincoln, Nye, Esmeralda and Clark Counties. Their mission is to provide wholesome food to hungry people, while passionately pursuing a hunger-free community. They have continually helped the fight against hunger in Southern Nevada’s communities, and we are thrilled to work with them this holiday season. From December 8th - December 31st we will be accepting donations from the below list directly at our store located at 7885 W. Sahara and Buffalo. Donate any of the following items and receive 10% off your order! Canned fruits and vegetables: Pop top canned products are always a plus!